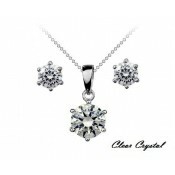 This striking pendant is made with 3 hoop charms which each hold 14 Cubic Zirconia Clear Crystals.. 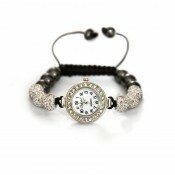 Available in Yellow Gold, Rose Gold or White Gold Colour, both feature 37 Crystals per pair, pier.. These exquisite fresh water pearl earrings are a definite eye catcher and will accompany any outf.. These beautiful White Synthetic Opal Gemstone Stud Earrings are rhodium plated and come with there v.. Featuring a pair of Rhodium Plated Solitaire Earrings with a pompom hanging from a Crystal made f..
Say your wish with a gift, we are proud to bring you a sophisticated and elegent bangle which fea.. 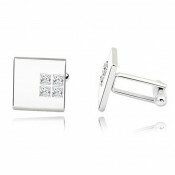 This classically elegant Cubic Zironia jewellery set comprises a necklet, bracelet, and stud earr.. These exquisite earrings each made with a total of 2.0ct Oval Cut Blue Lab-Created Sapphire Gem S..